One of the most common tasks that hydroponics growers have to carry out is to calibrate their pH meters in order to ensure that the readings are accurate. To do this it is generally necessary to buy somewhat expensive pH buffer solutions that will only last for a relatively small while before new solutions have to be bought. However the fact of the matter is that you don't need to buy these solutions forever and you can actually make your own using a few chemicals. This will be a ton cheaper than buying buffer solutions and will allow you to prepare solutions whenever you need them. 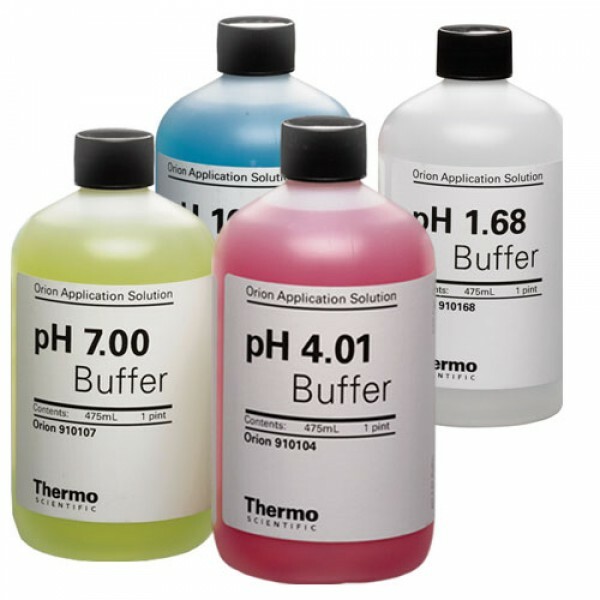 To calibrate a pH meter for hydroponics we generally need two different buffer solutions. One of these solutions needs to have a pH of 4 and another one needs to have a pH of 7. You can actually calculate the exact amount of chemicals you need to add to create these buffer solutions but this assumes that your water source is very pure (distilled water) and that your chemicals are also very pure and standardized. To make buffer solutions in less-than-ideal conditions we need to have a calibrated pH meter, which means you will need to purchase some buffer solutions, but only once. After you have calibrated your pH meter ensure that the pH meter measures the exact value that you want to prepare within the buffer solution you have purchased. So make sure that the pH meter when placed in the pH 7 buffer solution measures 7 if this the solution you want to prepare and make sure it measures 4 when placed in the pH 4 buffer solution if this is what you want to make. Once you have the pH meter in a coherent state with the solution you want to prepare we can now proceed to make a new buffer solution. To do this first fill a contained with tap water, make sure you don't fill it to more than 80% of its volume (to account for some volume expansion when we add the solids) and use your calibrated pH meter to measure its pH. For the pH 7 buffer add 10g of mono potassium phosphate per liter of solution (this doesn't need to be exact) and stir the solution until it dissolves. Then add KOH slowly, add it flake by flake, while you measure the pH until your pH reaches 7.00. You will notice that as the pH approaches 7 you will need more KOH to change the pH. If you go a bit above the intended pH you can add mono potassium phosphate to decrease it to 7.00. For the pH 4 solution you can perform the same procedure but instead add 20g per liter of citric acid and then add KOH slowly to increase the pH up to 4.00. After preparation leave the buffers to rest for a few hours and measure the pH again to ensure that your solution pH remains stable. Remember to store any prepared buffers in air-tight bottles and store these bottles in dark places. What we are doing with the above procedure is basically adding two acidic substances which have pKa values close the pH values that interest us. Close to 7 (mono basic phosphate) and close to 4 (citric acid). We then generate the necessary amount of conjugate base to reach the necessary pH level by adding KOH. The buffer strength is established by the initial amount of the acidic substance we add and the role of the KOH is basically to move the buffer pH to the point where we want it, a point that has a very high buffer capacity given the pKa values of the acids used. Of course the above is very far form the ideal analytical procedure to prepare a buffer but it's the easiest, cheapest and most effective way to prepare a buffer that is accurate enough for pH meter calibration use in hydroponics at a minimum cost. Sure, it requires an initial pH calibration - which can be a bit inconvenient - but you can buy a small couple of buffer bottles to calibrate and then prepare 2 gallons worth of pH buffer that you can then use to calibrate your pH meters for a long time. If you use tap water to prepare the above and some solids precipitate you can filter them before storing your solutions. Then measure the pH again after filtering to ensure that everything remains stable. Hello. I tried this but ph doesnt remain down for much time... And some people say citric acid is bad for good bacteria. So I am asking if phosphoric acid can be a better solution (since is also sold as ph down solution)... Is that better in terms of durability ? I mean the standard ph down solution of phosphoric acid sold out in hydro store. Thank you!